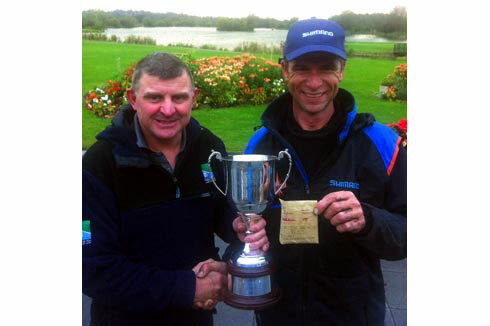 Nick Speed has won the 2012 Midland Angler of the Year fished at Barston Lakes, Solihull. The match has been true to its original format since venue owner Nigel Harrhy and myself first set it up when I was editor of Midland Angler magazine. It comprises of two three-hour matches, the first one on the feeder, and, staying on the same peg, the next match is three hours on the pole, with 30 minutes in between to weigh in. Nick drew peg 54, just past the point on the river bank, and fished the method at 50 yards to take 33.2lb of carp and F1s to win the section easily. He then fished worm over bloodworm to take 29lb of silvers on the pole, catching everything that swims to take a second section win and the match with two points. Pic: Barston owner Nigel Harrhy presents the trophy to Nick Speed along with his £250 prize money.